I am already fast forwarding into next month imagining my holiday table and dishes that will adorn it. 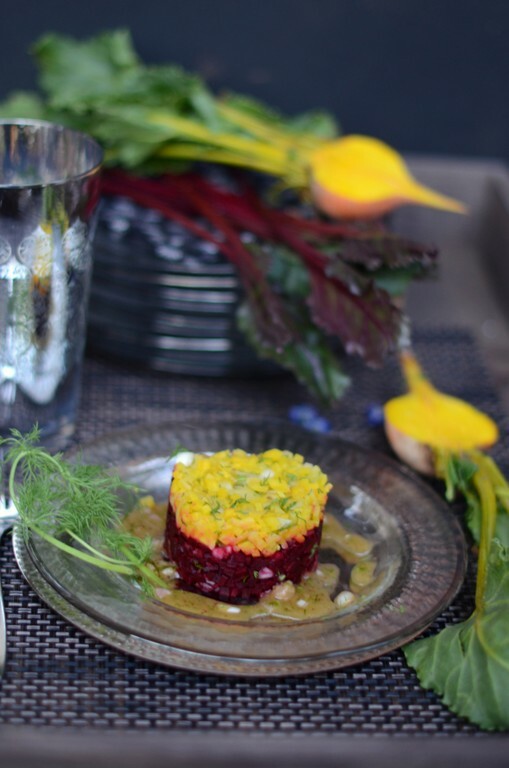 This dish was inspired by Jean-Georges', Cooking at Home with a Four Star Chef by Jean-Georges Vongerichten and Mark Bittman.The trio of Beet Ravioli with Beet Sauce, Beet and Ginger Salad and Beet Tartare is an inspiration. This recipe is entirely different from the ones in the book, but for years now, just before the holidays, I pull the book off the shelf and leaf through it in complete stillness. The sensations the images invoke are indescribable. Turn to the thinly sliced, layered and stacked up high, wedge of apple confit, and you will experience the sensations the images jumping out of the pages invoke as well. This post is as much about the recipe as the presentation as I strive to achieve around the holidays for that extra touch. This post is also my further exploration into food styling and moods and characters in photography. All I could think of for the last couple of days is textures. Also where here the beets take a more elegant persona, in the previous post they took on a more rustic feel. Equally beautiful. What Jean-Georges', Cooking at Home with a Four Star Chef encouraged me to do is use the cookie cutter as a form. On any given day I am usually way too lazy to bother but it's worth the couple minutes extra fuss around the holidays, the guests feel extra special. The salad is super simple as is achieving this presentation. All you need is a cookie cutter. 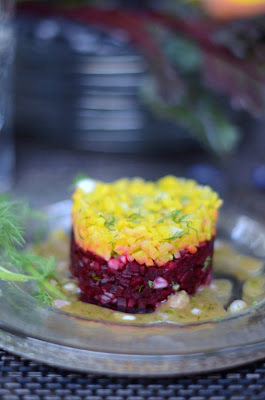 You can serve it with any of your favorite vinaigrette, or with just lemon and olive oil and a dash of salt and pepper, or with the Apple Cider, Dill vinaigrette below.You could use this assembly for tuna tartare and top if off with diced mango or a fruit dessert course. Cut stems off and peel the beets. Cook golden and red beets in two separate pots covered with water. Bring to a boil and reduce to medium heat. Cook for about 20 minutes or until al dente. Run cold water over beets while they are still in pots and drain separately. 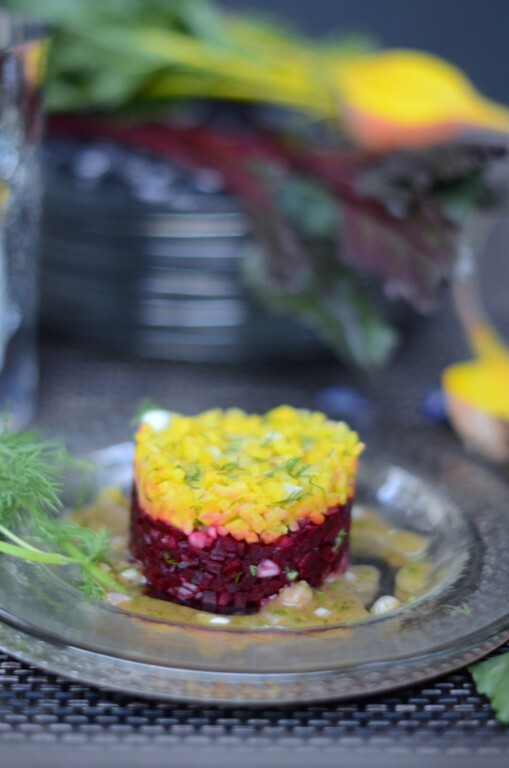 First, finely dice the golden beets on a cutting board and then the red, keep diced beets in separate bowls. Add 2/3 of the dill and shallot to red beets and the other 1/3 to the golden beets. Toss all vinaigrette ingredients in a separate bowl together and whisk for few seconds until emulsified. Taste and adjust for salt and pepper if necessary. Depending on the serving size, I used a medium 3 inch in diameter cookie cutter. Center a cookie cutter on a salad plate and fill it 2/3 up with red beets. Press gently with the back of a teaspoon to pack red beets and level. Add the golden beets on top of the red beets and press gently to pack and level with the back of a teaspoon. Apply pressure on top of the golden beet layer with the cushions of your index and middle fingers while gently pulling up the cookie cutter to release the beet salad from the cookie mold and voila! Drizzle a teaspoon of the vinaigrette on the plate around the base of the beets and have extra vinaigrette on the side. Garnish plate with a sprig of dill. What wonderful colors! That is a great idea and combination. TY Rosa. As always appreciate the support and friendship! I am serving it for Passover. :) & TY!! Looks great, but have you missed something apple-y from the list of ingredients for the vinaigrette? Thank you . Thank you. The word cider was missing in the title and the word apple was missing in the ingredients. That's what happens when I am on only few hours of sleep for the last few days. Appreciate it!!! Such a gorgeous looking dish. Looks straight out of a 5 star restaurant!! Love the recipe too..
Aww TY so much Ambika! Wow, what a gorgeous presentation. Beautiful. It inspires me to try with some chili peppers. The imagery alone should be placed on a wall! This looks terrific! i don't like shallots but it would be awesome using chopped fennel bulb too I bet!! mmmm beautiful and delish! You can dice red onions instead of shallots. Adding fennel bulb is a mighty good idea. I would probably saute it a tad with honey first and finely chop. I could see doing the same with a peeled and diced tart apple which will complement well the fennel, dill, cider vinegar and beets. Ahahaha Maureen, TY, though I had no problem diving into it yesterday as I was losing light fast while shooting it around 5:30-6pm:). They look absolutely delicious. Yes its tooooooo beautiful to eat, such eye catching picture. Was nice having leftovers for lunch the next day. I just added some arugula to it. This is such a gorgeous idea! Love it! Will email our Chef and maybe put this on the menu this season! We love beets! Ooh emailing the chef..:)TY Nelly! What a stunning presentation and all the flavors sound like they go together perfectly. TY Alison. Of course. Thx again. Looking forward! 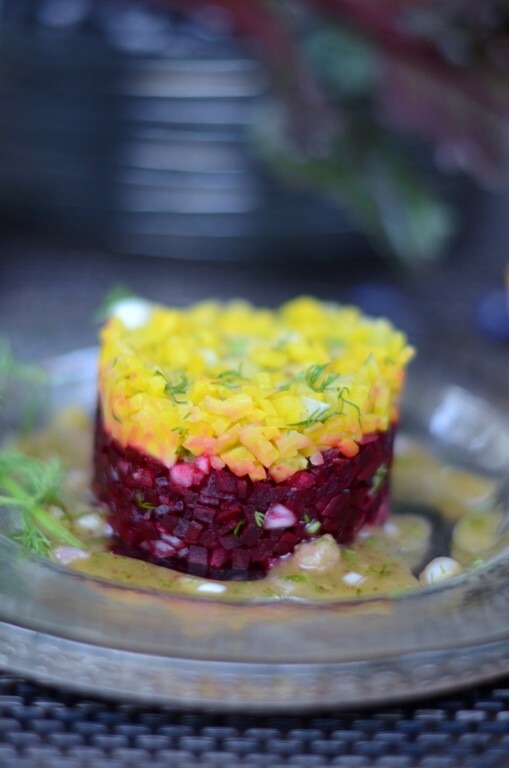 Beets are a favorite food and I must thank you for just one more delicious way to eat them. Yeah the plating can make a difference. I love beets but Imust say I need to make them more often. 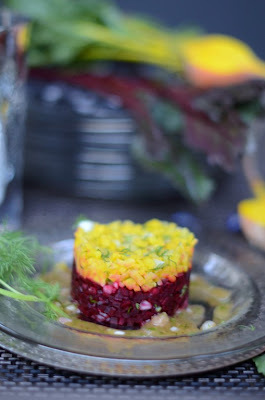 I used to make a Moroccan beet salad every week from Friday night dinners. Love the way you plated it Shulie! Absolutely gorgeous. TY Fifi. So sweet of you to say! This is so intricately beautiful Shulie! That's really a beautiful presentation, looks almost too pretty to eat! ahahaha had no problem diving into that very plate and then some! Thx Sylvie! So happy to have the luxury to visit Food Wanderings! Beets at home usually get roasted in the oven, and I shall try the way you cook beets stove top. Such lovely colors and presentation! Beautiful post Shulie! I totaaly agree, even my children will be eating this healthy food because of its colorful presentation. This is such an original idea! The presentation makes this the perfect dish to dress up a special occasion meal. golden beets - so so pretty! This looks great I have never seen anything like it before thanks for sharing.